Presented with support from Iaspis, the Swedish Arts Grants Committee's International Programme for Visual Artists. "Crystal Atmosphere" is presented with support from Iaspis, the Swedish Arts Grants Committee's International Programme for Visual Artists. 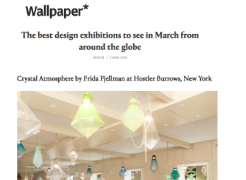 Hostler Burrows is pleased to announce an exhibition of work by contemporary Swedish artist and designer Frida Fjellman. This is the artist's first solo presentation at the gallery and in New York. 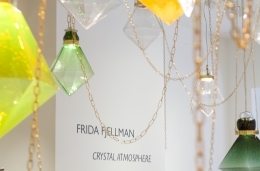 Fjellman’s "Crystal Atmosphere" is the reimagining of an installation originally commissioned for the NetJets private lounge at Art Basel and Art Basel Miami Beach in 2017. 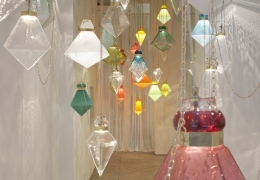 In this cohesive and immersive installation, Fjellman succeeds in engaging the viewer as they pass through a veritable “crystal forest,” where enchantment is cast by suspended glass prisms laced dreamily to one another by drooping chain. Designed, in Fjellman's words, to “impart a sense of calm as well as to intrigue and fascinate,” the experience is at once unabashedly romantic and quietly poetic. Fjellman’s keen use of color and the decadent beauty of the hand-blown crystals transfix the viewer with an energy that is direct and pure. Fjellman's design-oriented presentation is a distillation of her more elaborate tableaux. 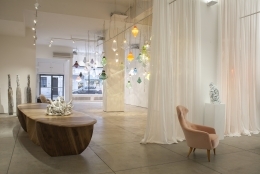 These often involve lifelike animal figures frozen in richly detailed ceramic, or manifestations of light and weather rendered in glass and neon; the overall effect is that of a dreamlike state. In this site-specific installation, 80-90 crystals are linked together in a finely wrought fantasy, hovering between nature and artifice. 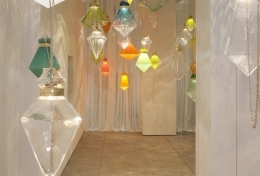 LED light passes from one prism to the next in a hypnotic transmission of color, undulating through the glass gems in a mesmerizing ebb and flow. As in much of Fjellman’s work, she plays here upon the wonderment of suspended art, which is often the essence and manifestation of her creativity - an opportunity to create spectacle. At the core of Fjellman’s practice is a divergence from the subtle minimalism that characterizes most traditional and contemporary Swedish art and design. The artist experiments with her own perception of the Swedish aesthetic, appropriating and subverting the traditional elements of Swedish design and typified beauty to create highly personal sculptures and installations, which are in many ways evocative of the Northern Swedish landscape. Fjellman's diverse and provocative projects, executed with impressive versatility across multiple media, have made her a standout contemporary artist both in Sweden and internationally. Born in 1971 in Sweden, Frida Fjellman currently lives and works in Stockholm. She is a graduate of Konstfack University College of Arts, Crafts and Design, where she received her MFA from the Department of Ceramics and Glass. 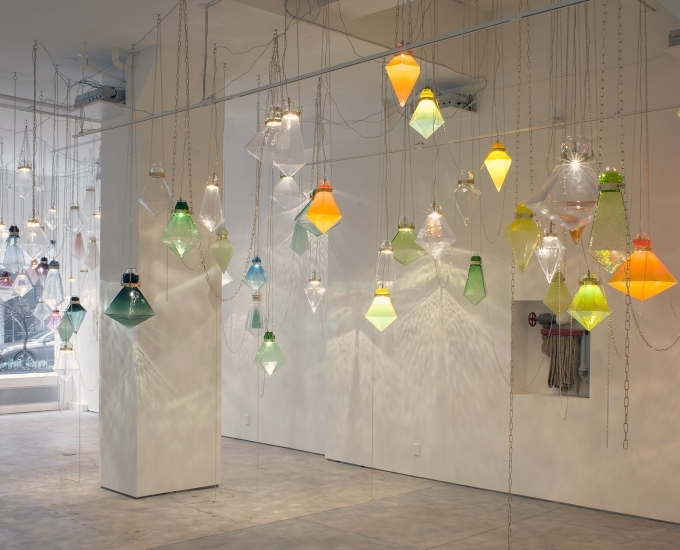 Additional studies include from Corning, The Studio in New York, and Pilchuk School of Glass in Washington. Fjellman is the recipient of numerous scholarships and awards, including The Stockholm City Cultural Award, the Erik Höglund Scholarship, and others. Her work has been placed in numerous prestigious public and private collections and institutions worldwide, including The Nationalmuseum in Stockholm, Ebeltoft Glass Museum in Denmark, The Röhsska Museum in Gothenburg, The American Museum of Glass in New Jersey, among many others.